C2Proficiency is the Cambridge English most advanced exam, for learners who have achieved an extremely high level of skill in the English language. The C2 Proficiency exam uses real-life situations that are especially designed to help you communicate more effectively and learn the language skills you need to function at the very highest levels of professional and academic life. negotiate and persuade effectively at senior management level in international business settings. study demanding subjects at the highest levels, including postgraduate and PhD programmes. understand the main ideas of complex pieces of writing. understand documents, correspondence and reports, including the finer points of complex pieces of writing. advise on or talk about complex or sensitive issues, understanding colloquial references and dealing confidently with hostile questions. write on any subject and take full notes of meetings or seminars with good expression and accuracy. Backed by the largest research programme of its kind, Cambridge English exams provide the most reliable reflection of your language skills. Choose when and how you take your exam - C2 Proficiency is available as either a paper-based or computer-based exam, allowing you even more choice over how you take your test. Cambridge English exams cover all major varieties of English and are designed to be fair to users of all nationalities and linguistic backgrounds. More than 3,000 employers, universities and colleges, government departments and other organisations around the world rely on C2 Proficiency. It is accepted wherever a high level of English language is required. Get your results in just two weeks with our computer-based exams. Once you have earned a Cambridge English certificate, you hold one of the most valuable English qualifications in the world. What does C2 Proficiency involve? C2 Proficiency is an in-depth assessment of English for people who want to use English in demanding work and study situations. It consists of four papers: Reading and Use of English, Writing, Listening and Speaking. The Speaking exam uses a face-to-face test with two candidates and two assessors. This creates a more realistic and reliable measure of your ability to use English to communicate. The C2 Proficiency Reading and Use of English paper accounts for 40% of the total mark and has different types of text and questions. In one part, you may have to read one long text or three or more shorter, related texts. The texts may be from books (fiction and non-fiction), non-specialist articles from newspapers, magazines and the internet. Part 1: is a multiple choice cloze, a single text with eight gaps. Candidates must choose one word or phrase from a set of four to fill each gap. Part 2: is modified cloze test consisting of a text with eight gaps. Candidates think of the word which best fits each gap. Part 3: is a text containing eight gaps. Each gap corresponds to a word. The stems of the missing words are given beside the text and must be changed to form the missing word. Part 4: has six discrete items with a lead-in sentence and a gapped response to complete in 3–8 words including a given ‘key’ word. Part 5: is a long text followed by some multiple-choice questions, each with four options (A, B, C or D). Part 6: is a text from which paragraphs have been removed and placed in jumbled order after the text. Candidates must decide from where in the text the paragraphs have been removed. Part 7: is a text, or several short texts, preceded by multiple-matching questions. Candidates must match a prompt to elements in the text and collocations, understanding detail, opinion and attitude, text organisation and structure, global meaning and main idea, and cohesion and coherence. The C2 Proficiency Writing paper has two parts. You have to show that you can write a variety of text types, such as essays, proposals, reports and reviews. Part 1 has one compulsory question and in part 2 candidates answer one question from a choice of four. In part 1 there are some material to read (two texts, each approximately 100 words). Using the information in this material, you have to write a discursive essay in which you have to summarise and evaluate the key points contained in two texts. Candidates must integrate a summary of these key points, an evaluation of the abstract arguments involved and their own ideas on the topic in a coherent essay. In part 2 there is a choice of four questions (2–5). For Questions 2–4, you may have to write an article, a letter, a proposal, a report or a review. If you have read one of the set books and want to write about it, you may decide to try Question 5. You have a choice of two tasks, 5(a) or 5(b) for this question. You may have to write an article, essay, letter, report or a review. This paper accounts for 20% of the total mark. 1. Colm Tóibín: Brooklyn (any edition); Teachers may choose to prepare candidates for questions on this set text by studying the film directed by John Crowley (2015) as well as, or instead of, the novel. 2. F. M.L. Stedman: The Light Between Oceans (any edition); Teachers may choose to prepare candidates for questions on this set text by studying the film directed by Derek Cianfrance (2016) as well as, or instead of, the novel. Use this checklist to improve your written English and practice for your exam. The C2 Proficiency Listening paper has four parts and 30 questions. For each part you have to listen to a recorded text or texts and answer some questions. You hear each recording twice. Requires you to be able to follow and understand a range of spoken materials, such as lectures, speeches and interviews. Part 1 consists of four short, unrelated recordings lasting approximately 1 minute each. You have to listen to the recordings and answer two multiple-choice questions for each recording. Each question has three options (A, B or C). Part 2 is a monologue or prompted monologue lasting 3–4 minutes. The questions are a series of incomplete sentences. You have to listen to the recording and identify the information you need (one to three words) to fill each gap. Part 3 is a recording with interacting speakers lasting 3–4 minutes. You have to listen to the recording and answer a series of multiple-choice questions, each with four options (A, B, C or D). Part 4 consists of five short, themed monologues, of approximately 35 seconds each. There are two multiple-matching tasks. Each multiple-matching task requires the selection of the five correct options from a list of eight. The range of texts and task types reflects the variety of listening situations which you need to be able to cope with at this level. Recordings will contain a variety of accents corresponding to standard variants of native-speaker accent, and to non-native accents that approximate to the norms of native-speaker accents. Texts vary in terms of length and interaction. Text types used include: interviews, discussions, conversations, talks, speeches, lectures, documentaries, instructions. A variety of task types are used. These reflect the different reasons for, and focuses of, listening: understanding opinion, attitude, gist, detail, main idea, speaker's purpose; gathering information about the speaker, the person being spoken to, the place or situation; inferring meaning, agreement and opinion. The C2 Proficiency Speaking contains three parts and you take it together with another candidate. There are two examiners. One of the examiners (the interlocutor) conducts the test and the other examiner (the assessor) listens to what you say and takes notes. Part 1 is a conversation between the interlocutor and each candidate. The examiner asks each of you a series of questions, addressing a question to each of you in turn, to give you an opportunity to talk about yourselves. In Part 2 The interlocutor gives you some spoken instructions and one or more pictures to look at. First, you have to answer a question which focuses on your reaction to aspects of one or more pictures (1 minute). The second part is a decision-making task which you have to do with the other candidate. In Part 3 the interlocutor gives you a card with a question and some ideas on it and you have to speak for about 2 minutes on your own. After you finish, your partner has to comment and the interlocutor then asks you both a question on the same topic. The interlocutor follows the same procedure with your partner and then leads a discussion with both of you. The Speaking test accounts for 20% of the total mark. If you would like to be paired together with a friend/classmate you can request this when you register for the exam. Please note however that research has shown that there are both advantages and disadvantages in taking the test with someone you know and that in the end it doesn’t matter. What is important is that the test judges you on your own performance. Try a paper-based sample C2 Proficiency exam paper. A guide to the exam, with an overview of what’s involved and examples of papers. Practical information about the session. Cheating is treated very seriously by Cambridge English and if you cheat you will not get a result or a certificate. If you are successful in the exam you will receive two documents: a Statement of Results and a certificate. Universities, employers and other organisations you apply to may ask you for either of these documents as proof of your English language skills. Your CEFR level for the overall exam. Depending on which university, college or organisation you are applying to, you may be asked to achieve a specific score or grade, either overall or for a particular skill. The exam is targeted at Level C2 of the CEFR. The examination also provides reliable assessment at the level below (Level C1). Scores between 162 and 179 are also reported for C2 Proficiency. You will not receive a certificate, but your Cambridge English Scale score will be shown on your Statement of Results. 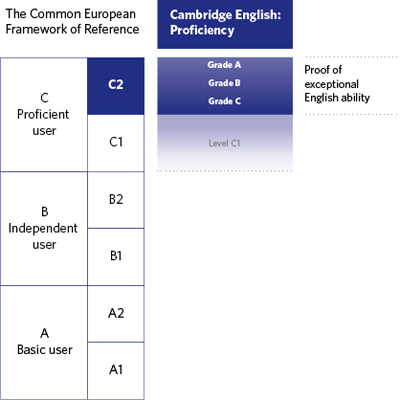 Please click on the image to the left of this text to find out the relationship between the CEFR levels, the Cambridge English Scale and the grades awarded in C2 Proficiency. 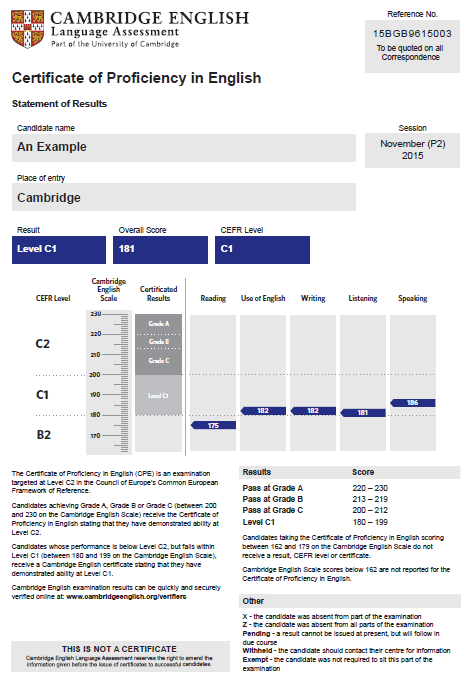 Cambridge English Results Online website. If you achieve grade A, B or C in your exam, you will be awarded the C2 Proficiency certificate at Level C2. If your performance is below Level C2, but falls within Level C1, we will recognise your achievement with a Cambridge English certificate stating that you demonstrated ability at C1 level. 1.- Your ID Number (a sequence of nine letters and numbers). 2.- Your Secret Number (a four-digit number). Both of these pieces of information can be found on your Confirmation of Entry, which you receive when you register for the exam. The CB sample test is only compatible with Mozilla Firefox. The reason is that this browser is packaged to the Connect Plus program which is used for Live Computer Based Exams. You can download Firefox for free here. Once downloaded, open Firefox and use the links below to view the tests. The place on the Web for Cambridge exam preparation! This website is for teachers or students of the B1 Preliminary, B2 First, C1 Advanced and C2 Proficiency. It contains up-to-date advice about the Cambridge English exams, grammar, vocabulary and exam practice for students and extra classroom resources for teachers. Join the Cambridge English Facebook page for help with exam preparation. Are you a private candidate? You can take the Cambridge English exams most months of the year. Use our online search to find an exam date. You can complete the exam registration form online or come to our offices to register for an exam. Payment for the exam must be made before the registration deadline. If you register after the deadline a late fee of 40 Euros will be applied. IMPORTANT: If you pay for your exam by bank transfer you should clearly state the name and surname/s of the candidate and the level and date of the exam session. All transfers must reach us free of bank charges or interest. Exams Madrid will not be responsible for these charges. You must send us the payment receipt by email to registrations@exams-madrid.com so that we may trace your payment with the bank. Your place on the exam will not be confirmed until we receive a payment receipt for the exam fee. Registration and payment for exams may also be made at our offices. If candidates choose this option payment should be made on registering. Payment may be made in cash, by bank transfer or credit/debit card. The candidate may register directly or send someone to register in his/her name. IMPORTANT: After we receive the exam registration form a confirmation of receipt will be sent to the candidate. Once the exam fees have been settled the candidate will receive confirmation that he/she is registered to take the exam. If you do not receive confirmation of your exam registration within 3 working days please phone us on tel. : 914 184 796 333. You should also check that our email has not been sent to your junk/spam mail folder.